Life wasn’t easy for Tony Collins as he grew up in the mean streets of the East End of London in the years before the Second World War. After his mother died when he was still only seven years old, his father, unable to hold down a job while coping alone with four young children, was forced to send them to an orphanage. But Tony came through the hardships and graduated with flying colours from the school of hard knocks, to head straight for a career as a commando with the Royal Marines. During a stint in Malta Tony fell head over heels for a local beauty, and after marrying her he soon began to regard the island as his home. He went on to rise rose through the ranks to become a warrant officer, turning down the opportunity to become a regimental sergeant major back in the UK because it would have meant uprooting his family from the island he had grown to love. 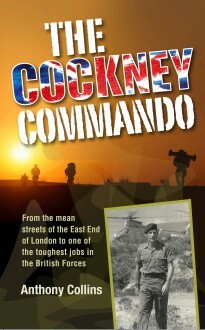 The Cockney Commando is a heart-warming story of triumph in adversity and of challenges overcome through love and courage.